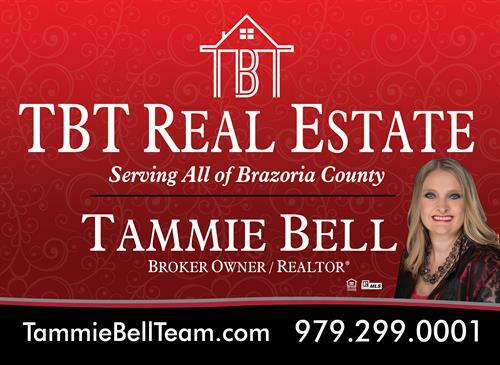 TBT Real Estate is owned by Broker, Tammie Bell, who has been involved in the local real estate market since 1994. They offer unparalleled service to all clients in the Brazoria County and surrounding areas. Complete satisfaction with their service and representation is their number one priority with Trusted Agents and Proven Success. As a platinum, multi-million dollar Realtor®, Tammie Bell consistently ranks at the top of her profession, thanks to both her clients and her peers. Effective systems were developed to manage the level of service her clients both expected and deserved, leading to the growth of her client base. The growth of her client base, lead to the formation of The Tammie Bell Team. The level of service provided by The Tammie Bell Team was persistent, leading to her continued growth and the start of TBT Real Estate. TBT Real Estate believes in training all of their agents to provide the same dependable real estate services using consistent systems that their clients appreciate. Buying or selling a home, land or commercial property is an investment process in which you want to be properly represented. Agents at TBT Real Estate understand what it takes to achieve this goal. TBT Real Estate will focus on your needs and make your priorities their priorities. They pride their services on getting to know each of their client’s personality, working for them to ensure that their goals are met. With the TBT Real Estate, you get more than a real estate agent; you get an advocate for all your real estate needs. Hwy 288 South into Lake Jackson. Take the This Way exit and turn left on This Way. Go past the second 4 way stop sign and we are on the left, corner of This Way and Parking Way.